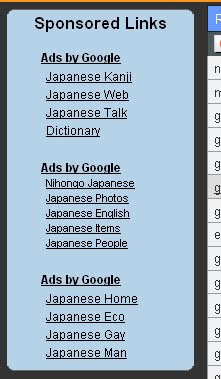 While writing the ao section of the previous post, I ended up on this page for various ways to translate the word green in Japanese. While there, I couldn’t help but notice a prominent “Ads by Google” listing that seemed to be skewing toward a very specific audience. See, in the bottom-most group? I’ve never seen this particular arrangement of links in a Google ad before. Taken together, they seem a little strange. It’s even odder, I guess, that while glancing over them I initially read the first two as homo and ecce, as if Ecce Homo had been transposed. And spelled wrong. Twice.